Please check back often as we update the progress on all K-8 classroom renovations and Lincoln Elementary construction projects. The design phase for the new Lincoln Elementary involved these four phases. The Design Phase began soon after the passage of the bond and operating levy in May 2018 with the Proramming Stage and continues through the Spring of 2019. In 2015, we began developing a strategic plan to address the long-range facility needs and vision of our district. We engaged parents, community members and school leaders, as well as outside experts, to assess our current facilities and identify needs to assure our district is well prepared for the future. This Master Facilities Committee developed an understanding of current and projected student enrollment and studied environments that better support current and evolving practices in education for our students. In 2017, we developed a draft Master Facilities Plan to address overcrowding and the need to update our facilities. We worked with our Master Facility Planning Committee to develop this proposed plan to present to the community for input. The district is firmly committed to transparency and engagement with the Gahanna community. Families and community members hosted “coffee discussions” throughout our school district to discuss the draft of this plan and our future facility needs. The involvement and feedback were tremendously helpful, and changes were made to the draft plan based on the feedback we received. It specifically considers the growth occurring in Jefferson Township, where 206 homes and a 72-unit residential/extended stay hotel are slated to be built in the near future. A final draft of the plan, which outlines two distinct phases, was presented to the Board of Education on January 11th, 2018 and approved. 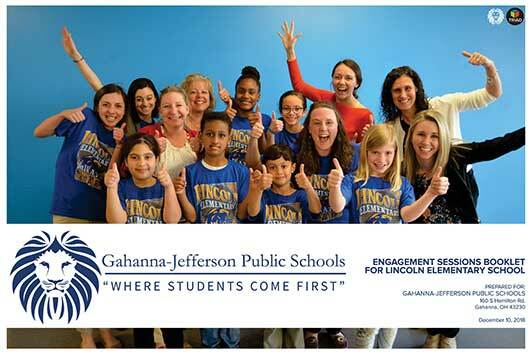 Shortly after the passage of the Bond and Operating Levy in May of 2018, Gahanna-Jefferson Public Schools began to engage teachers and students in conversations about the new Lincoln Elementary. The list of "must haves" from the students, combined with input from the teachers soon formed a list of design elements that would be featured in the new Lincoln Elementary. District administrators and architects from TRIAD Architects also met with residents of the Gahanna-Jefferson community in a series of 3 community meetings, gathering valuable input about site placement, parking, playgrounds, and exterior features. The booklet above is a collection of information gathered by TRIAD Architects during the engagement sessions with students, staff, and residents of our community. Gahanna-Jefferson Public Schools will focus on the construction of a new elementary school and districtwide classroom renovations in 2019. 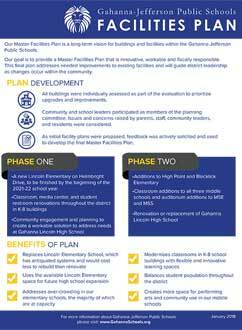 After the passage of the bond issue in May, Gahanna-Jefferson Public Schools is wasting no time moving forward with projects outlined in Phase One of the Master Facilities Plan. 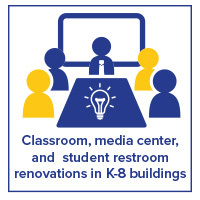 An exciting part of the Master Facilities Plan includes classroom, media center, and student restroom renovations in our elementary and middle school buildings throughout the district. Gahanna community had the opportunity to give input about the new Lincoln Elementary in a series of three community meetings. Three meetings cover design of Gahanna-Jefferson's new elementary building. The students of Lincoln Elementary have ideas about what should be in the NEW Lincoln Elementary.